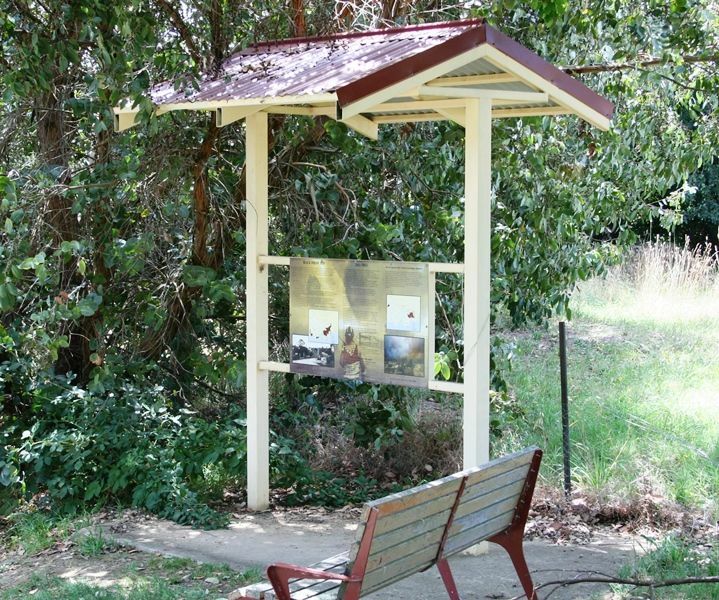 A plaque commemorates the volunteers who served in the 2003 bushfires. 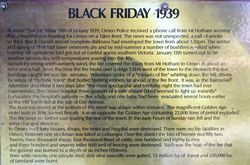 There is also an information plaque at the site giving details of the Black Friday bushfire of 1939. The Eastern Victorian alpine bushfires, started with eighty seven fires that were started by lightningl in the north east of Victoria on 8 January 2003. Eight of these fires were unable to be contained and joined together to form the largest fire in Victoria since the 1939 "Black Friday" bushfires. The main fire burnt over 13,000 km² over 59 days before it was contained on 7 March 2003. 41 homes were destroyed and over 9,000 livestock killed. Thousands of kilometres of fencing was also destroyed. This was the longest running fire until the 2006-07 Great Divide fires. In early February, at the peak of the fires, around 3,760 people were involved in the fire effort, excluding local CFA brigades. This figure includes 160 Defence Force staff, over 300 interstate firefighters, 33 alpine firefighting specialists from New Zealand and 35 personnel from the United States. In total, 15,725 personnel were directly engaged on fighting these bushfires. The areas affected included, Mount Buffalo, Mount Bogong, Mount Feathertop, Bright, Dinner Plain, Benambra, Omeo, Cobungra, Shannonvale, Bundara, Anglers Rest, Sunnyside, Glen Wills and Dargo. A year ago the Omeo community was unable to celebrate Australia Day - this year they’re planning a double celebration with support from East Gippsland Shire Council. The “Omeo Moving On” event is taking place on Monday, 26 January in the Omeo Courthouse Gardens (next to the Shire offices) starting at 11.00am, with plenty of activities planned to keep everyone entertained. It was one year ago on Australia’s national day that Omeo, and indeed other parts of East Gippsland, felt the full force of the devastating 2003 bushfires. It was far from a celebration for local residents. Therefore this year they want to make up for last year’s lost opportunity. East Gippsland Shire Council, in conjunction with the Omeo Business and Tourism Association, is organising the event. Thanks to a $5,000 grant from the State Government, “Omeo Moving On” will feature live music (Country, Australian and Irish), children’s activities and much more. Local school children will sing the National Anthem and raise the Australian flag, while Cr Ben Buckley will officially welcome everyone and thank the many volunteers. 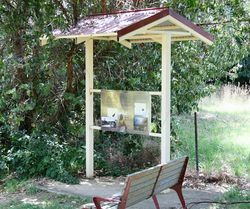 A highlight will be the unveiling of a plaque by Omeo CFA Captain, Graeme Symons, commemorating the volunteers associated with the 2003 bushfires. The East Gippsland Shire Council thanks all who were involved in the fire and the aftermath. The Department of Sustainability and Environment, the Country Fire Authority and the Metropolitan Fire Brigade and other Victorian Government Agencies and all interstate and overseas firefighting personnel. Thanks also to Service Clubs and Volunteer Organisations, individual landholders and all community minded people who contributed so much in fighting the fire, in supporting the crews and after the fire in clean up operations, rebuilding fences and donating goods. There were countless people unknown and unsung we honour and acknowledge your efforts.